On May 14, 2018, Ukrainian filmmaker Oleg Sentsov imprisoned in the Russian Federation began a hunger strike. UCMC takes a look at his demands, physical condition as well as at the possible consequences of the decision. Who is Oleg Sentsov and why is he imprisoned in Russia? Ukrainian film director Oleg Senstov made several films – two shorts “A Perfect Day for Bananafish” (2008) and “Bull’s Horn” (Rih Byka, 2009), feature-length “Gamer” (2011) and “Rhinoceros” (Nosorih, 2013) that is a work in progress. Sentsov is also the author of a book of short stories. Oleg Sentsov (left) and Oleksandr Kolchenko during the trial. Oleg Sentsov and activist Oleksandr Kolchenko were arrested in Crimea on May 10, 2014, under the charges of plotting a series of terrorist attacks. 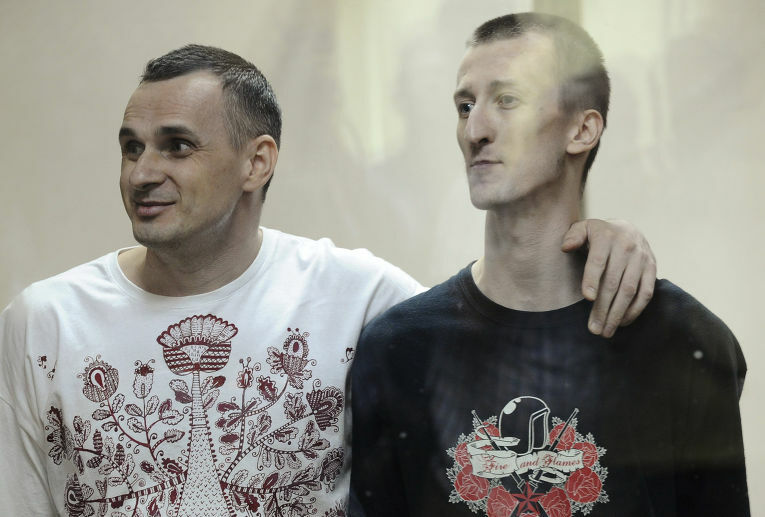 Despite the clearly political nature of the case, lack of direct evidence, and international reaction, in August 2015 the court sentenced Sentsov and Kolchenko to 20 and 10 years respectively in a maximum-security colony. Two more Crimeans were arrested in the same period of time – Hennadiy Afanasiyev and Oleksiy Chyrniy. In 2016, Afanasiyev was exchanged for Russian captured in Donbas, while Chyrniy is still behind bars in Magadan. Sentsov and Kolchenko were kept in a Moscow pretrial detention center, tried in Rostov, they were then taken to the Ural up till the Russian Arctic. Together they traveled almost 20 thousand kilometers which makes it half the way around the globe. Why did he start a hunger strike? 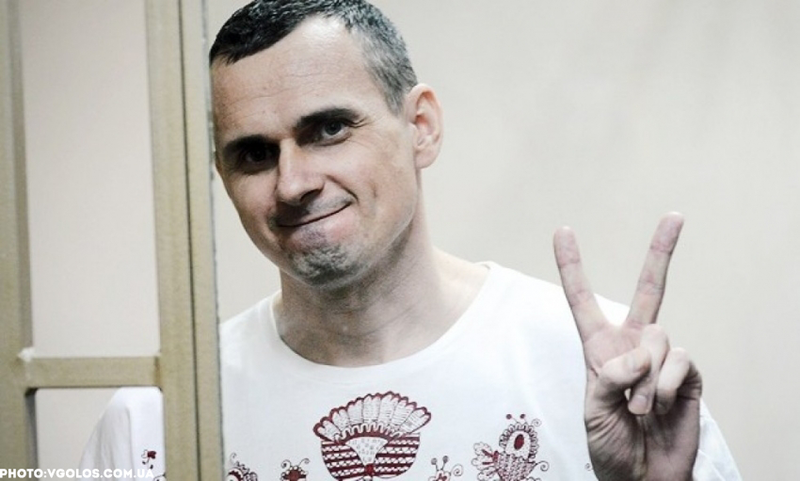 The motivation behind Oleg Sentsov’s decision to go on hunger strike is simple: he demands that all the Ukrainians – Kremlin’s prisoners in Russia and in the annexed Crimea – are liberated. “I, Sentsov Oleg, a citizen of Ukraine illegally sentenced by the Russian court, while in the penal colony in Labytnangi, announce an indefinite hunger strike effective May 14, 2018. The only condition to stop it is the liberation of all Ukrainian political prisoners held in the Russian Federation. Together we stand until the end! 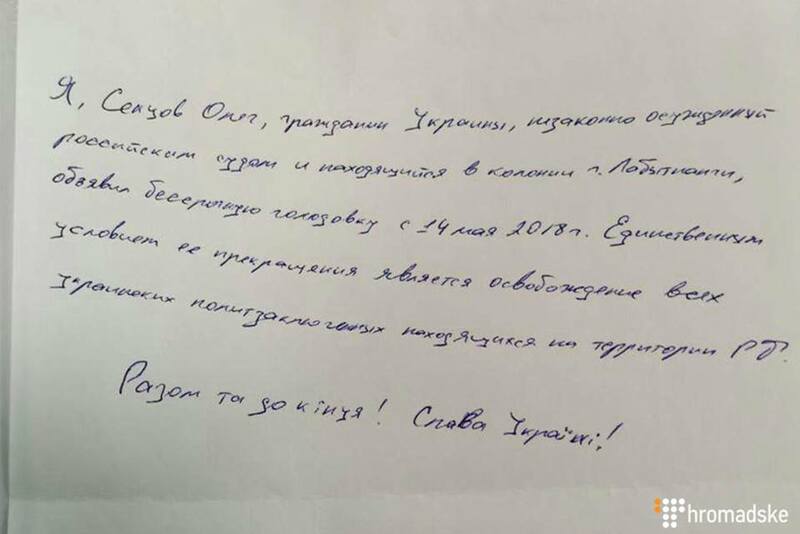 Glory to Ukraine!” wrote Sentsov in a hand-written note. Oleg told his lawyer that he had been preparing himself for this for two months, refusing the food parcels and physically training his body. Dmytro Dinze, Oleg Sentsov’s lawyer, warned his client of all the possible consequences, including the ones irreversible for his health. However, Sentsov said he is prepared to die if his demands are not met. Sixty-four Ukrainian political prisoners are held in Russia and in the annexed Crimea. Together they have been sentenced to 189 years in prison. Eight of them have been liberated. The complete list of the Kremlin’s prisoners, their stories, news as well as the information on how to help them, is available on the English-language website Let My People Go. Sentsov’s family currently resides in Crimea. His mother, Lyudmyla, is 75. In 2016 it became publicly known that Sentsov’s wife Alla with whom they had been married for 15 years, plans a divorce. According to Hennadiy Afanasiyev, a liberated Kremlin’s prisoner, the Sentsovs were planning the divorce before Oleg’s arrest in 2014 but they did not finalize the procedure. Since 2016, Alla has been saying that the status of the prisoner’s wife in Crimea makes it impossible for her to get a loan and buy an apartment for herself and the two children they have with Oleg. Oleg and Alla have two children: 15-year old Alina and 11-year old Vlad who has autism. It is Oleg’s older sister who is mostly taking care of the children, on weekends they visit their grandmother in the countryside. Vlad studies in a specialized school in Simferopol and takes theatre classes at a studio. Alina is keen on photography and drawing. Relatives say that Oleg refuses to let his family visit him in the colony. He says it is easier for him to keep his morale high that way. “I cannot support Oleg in this. I think it is unwise, and it is going to bring more damage than good. I am very much afraid for him. It’s been four years that Oleg is in hellish conditions, without vitamins, sun, and good nutrition as well as under a terrible psychological pressure. This step of his makes me nervous, but I know Oleg and I know that he is not going to give up. What’s left to me is only to hope that he will endure this and reach the goal he set,” Kaplan commented. I encourage the international community to continue exercising the pressure on Kremlin so that the Ukrainian political prisoners return back home to their families as soon as possible. We continue our fight and are making each and every effort to liberate all illegally imprisoned Ukrainians held in the territory of the occupied Crimea, Donbas, and in the Russian Federation. Sentsov is currently in a single cell. His lawyer Dmytro Dinze does not rule out that Oleg might be sent to undergo a mandatory psychiatric examination and force-feeding will be applied. Ukrainian authorities do not have that many tools to liberate Ukrainian political prisoners. One of the most efficient is exchanging them for Russians detained in Ukraine. It was the method used to free Nadia Savchenko, Yuriy Soloshenko, and Hennadiy Afanasiyev. The government plans to disburse almost UAH 97 million ($3,7 million) to pay the legal expenses borne by Ukrainian political prisoners currently held in Russia and in the occupied territories of Donbas and Crimea. Until now, the families of the prisoners themselves have been paying for the lawyers. They could also rely on human rights organizations, private donors, and other non-governmental sources. Unfortunately, as for now, the state money disbursed for paying the legal services for the political prisoners remain on paper only. The commission to manage the funds has not been created. Moreover, the document foresees including representatives of the Ministries of Justice, Finance, Social Policy, Internal Affairs and of the Security Service into the commission. However, neither of the above agencies is dealing with the affairs of political prisoners in full and is able to follow the court trials in the Russian Federation. Human rights organizations that have been monitoring the human rights situation since the start of Crimea’s annexation and of the military conflict have been left aside. Finally, the criteria for being granted a status of a political prisoner are unclear, there is no respective official status. For now, the families keep looking for the money on their own.